You’re invited to be part of a special announcement at Laurier. On Tuesday, Sept. 8, the university will name its School of Business and Economics. The announcement will begin at 10:15 a.m. and will be livestreamed for all members of the Laurier and external communities. Archived footage will be available after the event concludes. SC Johnson Building, 38 Market Street, Brantford. Host: Brian Rosborough, senior executive officer, Brantford campus. The Exchange Tower, 130 King Street West #1800, Toronto. Co-hosts: Hugh Munro, MBA director, School of Business and Economics, and Bill Webb (BBA ’86), member, Campaign Cabinet. 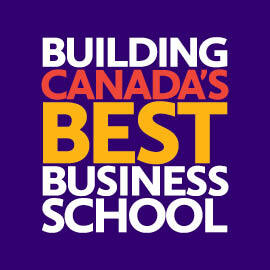 This announcement heralds an exciting new era for Laurier and marks a key milestone in the university’s Building Canada’s Best Business School campaign. The campaign aims to raise $55 million for the School of Business and Economics (SBE) to support student scholarships, help retain and recruit top faculty, complete the new $103-million home for SBE, and strengthen Laurier’s unique, pioneering programming.